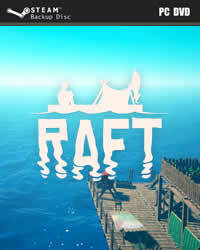 In the survival game RAFT you can unlock a total of 30 achievements on Steam. In this guide we show you all the achievements and their conditions. Team up with a friend in multiplayer. It's better without the salt. Craft and place a simple purifier. Have 20 storages on the same raft. Have 20 cropplots on the same raft. Craft and place a simple grill. Research everything in the research table. Craft and place a sail and a stationary anchor.